The Easy Chuck uses patent pending Snap-Lock Technology to change the jaws without wrenches or jaw screws in less than 30 seconds. Simply use the included Jaw Key to depress a keeper in the jaw and pull it out. The put the jaw into the chuck, push it into the slot until you hear it click. The jaws are not numbered and can go into any slot. The Zoom Ring allows the jaws to be opened and closed quickly using your fingers. You can easily position the workpiece by hand before final tightening with the t-handle allen key. 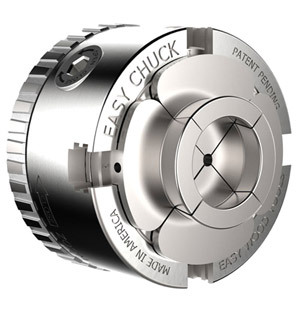 The Easy Chuck is direct threaded for more accuracy. It is available in 1"x 8, 1-1/4" x 8 or 33mm spindle sizes. Two set screws are provided to lock the chuck on the spindle of lathes with reversing.